Thanks again for your interest in my Boot Camp! The Cedarville, OH Boot Camp will start on Monday, July 8, and finish on Thursday, August 15. 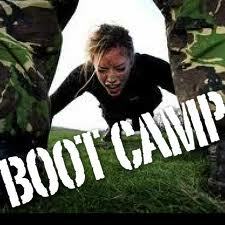 The Beavercreek, OH Boot Camp will start on Friday, July 12 and finish on Friday, August 16. The Cedarville, OH sessions will be held on Monday and Thursday at 7 p.m. at the outdoor track at Cedarville University. If the weather is too hot or stormy, we will transition to the indoor track. The Beavercreek, OH sessions will be held on Friday’s. at Royal Point park directly behind the Fairfield Commons mall. (see me for directions). The time is current TBD, but it will likely be 6.30 p.m.
* For those who do not live locally, you may choose to participate in a modified Online Boot Camp which includes daily check-ins, workouts, and nutrition consults. Please contact me if you are interested in this Online Boot Camp program. The Cedarville Boot Camp will be $120 payable via cash, check, or PayPal. If you are aware of dates that you will be out-of-town, I will reduce your cost based on the sessions that you will not be able to attend. However, you will not receive your money back for sessions that you choose not to attend when you are in town. The Beavercreek Boot Camp will be $60. Please register for the Boot Camp below. After you register, I will calculate your Boot Camp cost based on how many sessions you are planning to attend. I will send you an invoice via PayPal. You may pay via PayPal, check, or cash. I will also send you the health forms, waiver and liability forms. Payment (in full) and all forms are due prior to the start of Boot Camp. Please let me know if you have any questions at all! How Can I Start Labor?